Mary Straubel vividly remembers the day in 2009 that thrust her into a contentious debate over wind energy that would create a deep rift in the quaint tourist towns of northwest Lower Michigan. "I came home from work one day and someone had put up an anemometer (wind gauge) across the street," said Straubel, a nurse who lives in a rural township southeast of Frankfort. "I had no idea what it was." She learned from the property owner that Duke Energy was looking to build a large wind farm north of Frankfort, on farmland near the Lake Michigan coast. The project — which has since been postponed indefinitely — divided the community, spurred a successful recall of three members of the Joyfield Township Board of Trustees and left simmering resentment in the communities of Frankfort, Beulah and Benzonia. "Its horrid," said Straubel, who led the effort to recall the three township board members who supported the wind farm. "People in our township are angry; people refuse to see the other side’s logic; and there have been threats of physical violence. It’s just been terrible." Straubel said other Michigan communities should expect similar turmoil if voters approve Proposal 3. The proposed constitutional amendment would require Michigan’s utilities to obtain 25 percent of the electricity they sell from renewable sources — wind, solar, biomass or hydropower — by 2025. Supporters of Proposal 3 said increasing wind power is the quickest way to meet the 25 percent renewable energy mandate. The state would need between 2,000 and 3,100 new wind turbines to meet the proposed renewable energy standard. The four windiest regions of Michigan — the Thumb, Allegan County, Antrim and Charlevoix counties, and an area encompassing Manistee, Benzie and Leelanau counties — have the best potential for wind energy, according to a 2012 report by the Michigan Public Service Commission. But some of those areas also rank among the state’s most popular regions for tourism. Large wind farms already have been erected in the Thumb, southeast of Ludington and near Lake City. Proposal 3 could potentially turn the Thumb into a massive, sprawling wind farm. Faced with that prospect, county commissioners in Huron County unanimously passed a resolution in September opposing Proposal 3. Several residents of Huron County sued the firm that installed a wind farm near Ubly, claiming the turbines were noisy, cast annoying shadows and diminished their quality of life. The case was settled out of court; the terms were never disclosed. 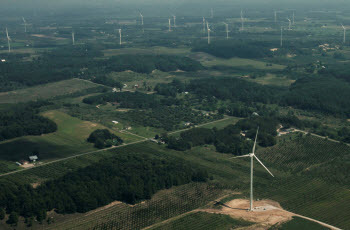 Hugh McDiarmid, a spokesman for the Michigan Environmental Council, which is promoting Proposal 3, said wind turbines that are sited and operated properly pose no problems for nearby residents. "Independent studies around the world consistently found that wind farms have no direct impact on physical health," McDiarmid said. "That cannot be said of fossil fuel electric plant generation, which poisons the environment and creates a host of human health problems including premature death, crippling asthma and respiratory and circulatory impairments." If Proposal 3 passes, Michigan utilities would have 10 years to triple the amount of wind energy that is projected to be online in the state by 2015. Consumers Energy spokesman Jeff Holyfield said it typically takes about five years to build a wind farm, from the time a company begins acquiring land leases to the day the turbines start spinning. State studies estimate that Michigan will need about the same amount of installed electric generating capacity in 2025 as is currently in place. Proposal 3 would require that Michigan’s utilities obtain about 5,000 megawatts of electricity from renewable energy sources by 2025. To achieve that primarily with wind energy would require installing between 2,000 and 3,100 wind turbines, according to supporters of Proposal 3 and industry officials. Because each wind turbine requires a clear area on the ground beneath it, the new turbines needed to meet the 25 percent renewable energy mandate would occupy between 276,000 acres and 500,000 acres of land. In other words, Michigan could obtain 25 percent of its electricity from a fleet of wind turbines that would occupy, at most, 1.4 percent of the state’s total land mass. The state’s two largest utilities, DTE Energy and Consumers Energy, have together already leased 127,000 acres of land for wind farms in the Thumb and West Michigan, according to company brochures. Holyfield said it would be difficult to install 3,100 wind turbines by 2025, given the controversial nature of wind farms. He said a statewide zoning ordinance might be needed to facilitate the installation of wind turbines. The prospect of a statewide zoning ordinance that usurps local control prompted the Michigan Townships Association and the Michigan Association of Counties to oppose Proposal 3. The MPSC had dropped the Antrim/Charlevoix counties wind zone from their study after it was determined that the already small area was further reduced dramatically by the FAA--you cannot site such tall structures within 6 miles of a regional airport (Charlevoix). However, I wouldn't doubt there are shennanigans going on in Lansing. Approval of Prop 3 would probably result in the taking away of local zoning control over windfarms. It only takes 5 years to build such an inefficient money-sucking monstrosity, but it you want to build clean, safe, benign, ZERO CO2 advanced nuclear power generation, you can't. We need global warming solutions that work, but INDUSTRIAL WIND TURBINES ARE A SHAM AND DO NOT PROVIDE CLEAN ENERGY! Not one coal or gas plant the world over has been decommissioned because of IWTs...and eliminating our dependence on fossil fuels is their whole purpose. To quote an expert: “Because wind blows intermittently, electric utilities must either keep their conventional power plants running all the time to make sure the lights don’t go dark, or continually ramp up and down the output from conventional coal-or gas-fired generators (called “cycling”). But coal-fired and gas-fired generators are designed to run continuously, and if they don’t, fuel consumption and emissions generally increase.” This is happening worldwide, and in places like Colorado and Texas where CO2 and power plant pollution have increased since installing wind farms: http://www.forbes.com/2011/07/19/wind-energy-carbon.htmlhttp://www.denve... http://www.clepair.net/IerlandUdo.html http://www.thespec.com/news/ontario/article/610422--cost-of-green-energy... The wind industry is built on crony capitalism, it is the only way it can exist. Taxpayer money builds them and power companies are mandated to buy wind generated power at much higher rates than conventionally produced power. There is no true benefit, except to wind power companies, politicians and lobbyists. The Michigan Energy Michigan Jobs ballot initiative is supported by more than 230 Michigan businesses, prominent Republican and Democratic leaders, unions, health professionals such as the Michigan Nurses Association, environmental groups, faith leaders and more. One of the most exciting benefits of the 25x25 goal is that it will boost our economy for years to come. According to a recent report by Michigan State University economists and academics, the 25 by 2025 proposal will create jobs and generate $10.3 billion of private investment in Michigan’s economy. Other benefits of the 25x25 campaign include: • It will spark development of more wind energy in Michigan, which as of July 1, 2012, had 487 megawatts of wind-powered electrical generating capacity online (enough to power more than 150,000 homes), with enough wind farms currently under construction to double that by the end of the year. • Passage of the ballot proposal is expected to drive development of another 4,500 megawatts of wind power in Michigan, a state with one of the top 20 wind resources in the country. • The 25 by 25 proposal will lower electricity rates. That’s because the proposal caps any resulting increase at 1 percent, safeguarding Michigan electricity consumers. The fact that backers of the proposal support this cap underscores that they believe the renewables requirement will not have a meaningful impact on rates. • It will also continue the growth of wind factory jobs in Michigan, which has fast become a manufacturing powerhouse for the industry. At least 31 businesses produced wind components in Michigan. For example, wind turbines are manufactured in Saginaw, and wind towers are now being made on a former brownfield site in Monroe. Voting “yes” on proposal 3 means we are getting serious about protecting Michigan’s health, improving our economy, and securing our future energy needs.